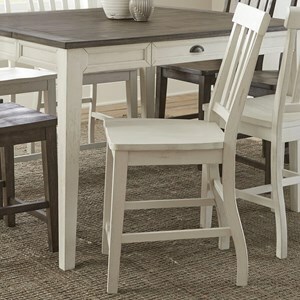 Capture inviting farmhouse style with this charming counter-height dining table. The table's clean lines give it a casual silhouette, while details like picture frame molding around the table apron and cup pull hardware exude farmhouse style. Drawers on either end of the table add convenient storage space, and an included leaf lets you extend the table length for additional seating and serving space. The Cayla Farmhouse Counter Height Table with 18" Leaf at Morris Home in the Dayton, Cincinnati, Columbus, Ohio, Northern Kentucky area. Product availability may vary. Contact us for the most current availability on this product. Leaves One 18" Table Leaf Extends Table Length from 36" to 54"
Case Construction Hardwood solids with mango and acacia veneers. 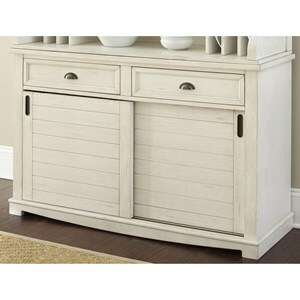 Finish Antiqued White finish with wire-brushed dark oak accent finish. Case Detail Tapered legs, planked wood tops. 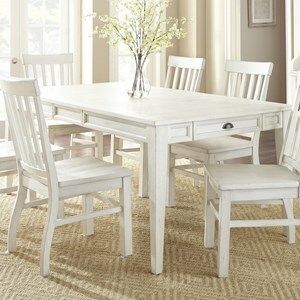 Create a dining space that is bright and full of charm with the Cayla dining group. 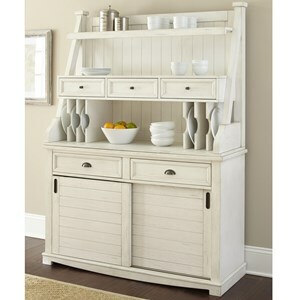 The farmhouse-inspired designs showcase clean lines with slat detailing, plank tops, and cup-pull hardware. 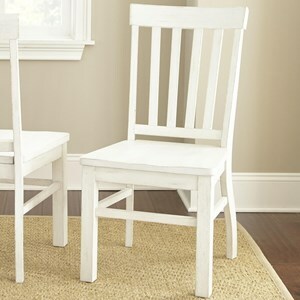 An Antiqued White finish epitomizes cottage and farmhouse style, while a wire-brushed Dark Oak accent finish available on the chairs and two-toned pieces lets you make more of a rustic statement. 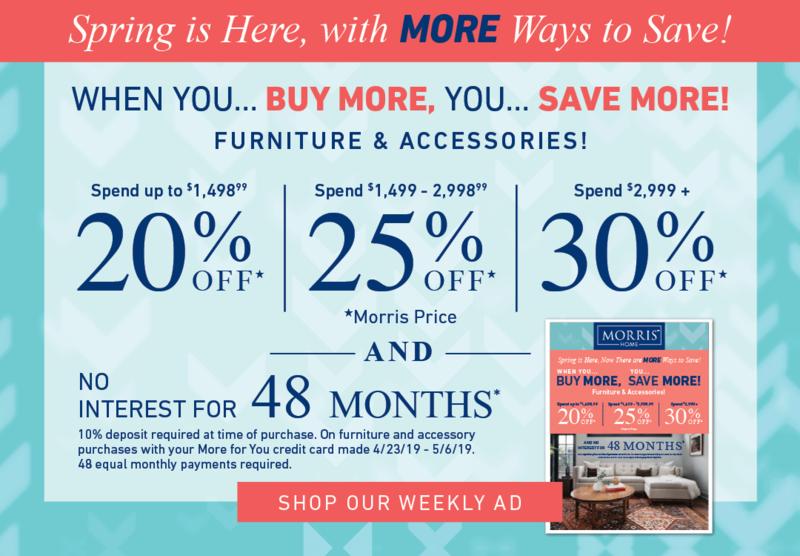 The Cayla collection is a great option if you are looking for Relaxed Vintage Casual Cottage furniture in the Dayton, Cincinnati, Columbus, Ohio, Northern Kentucky area. 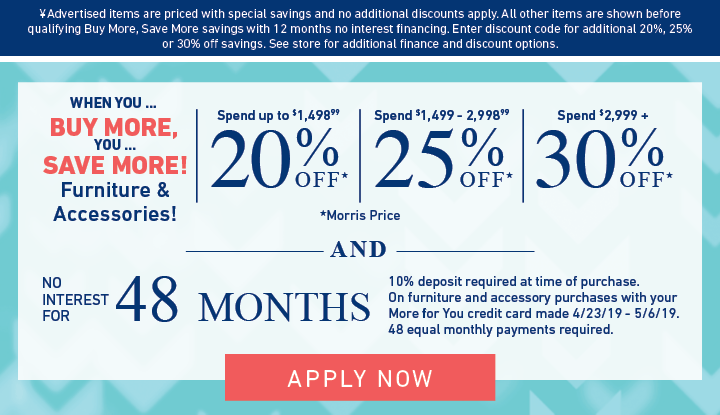 Browse other items in the Cayla collection from Morris Home in the Dayton, Cincinnati, Columbus, Ohio, Northern Kentucky area.